The computer, writes Peter Lunenfeld, is the twenty-first century's culture machine. It is a dream device, serving as the mode of production, the means of distribution, and the site of reception. We haven't quite achieved the flying cars and robot butlers of futurist fantasies, but we do have a machine that can function as a typewriter and a printing press, a paintbrush and a gallery, a piano and a radio, the mail as well as the mail carrier. But, warns Lunenfeld, we should temper our celebration with caution; we are engaged in a secret war between downloading and uploading--between passive consumption and active creation--and the outcome will shape our collective futures. 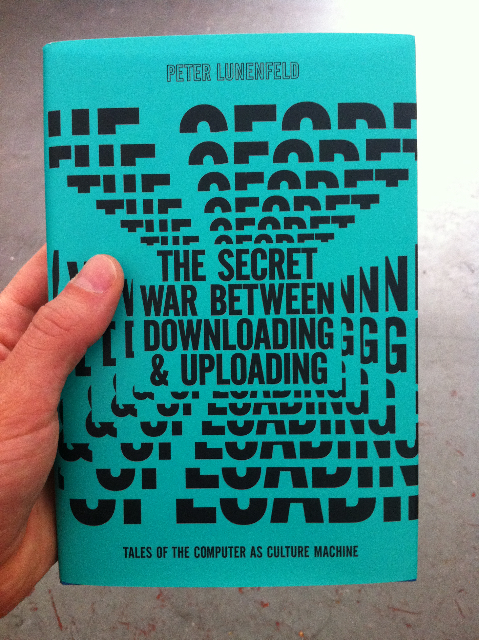 In The Secret War Between Downloading and Uploading, Lunenfeld makes his case for using digital technologies to shift us from a consumption to a production model. He describes television as "the high fructose corn syrup of the imagination" and worries that it can cause "cultural diabetes"; prescribes mindful downloading, meaningful uploading, and "info-triage" as cures; and offers tips for crafting "bespoke futures" in what he terms the era of "Web n.0" (interconnectivity to the nth power). He also offers a stand-alone genealogy of digital visionaries, distilling a history of the culture machine that runs from the Patriarchs (Vannevar Bush's WWII generation) to the Hustlers (Bill Gates and Steve Jobs) to the Searchers (Larry Page and Sergey Brin of Google fame). After half a century of television-conditioned consumption/downloading, Lunenfeld tells us, we now find ourselves with a vast new infrastructure for uploading. We simply need to find the will to make the best of it. GenText is a powerful and innovative interactive text application that allows readers to access arguments at three levels – short abstract, single screen synopsis, and full selection – with the dynamic interaction offered by pinching and reverse pinching literalizing the metaphor of "zooming" between the levels in a text. GenText recounts the history of how the computer became our culture machine, and is adapted from “Generations,” the last section of The Secret War Between Downloading and Uploading. GenText offers a leading-edge interface for reading on portable touch screen devices such as the iPad and GenText exploits the affordances of our “print plus” moment. GenText will be of special interest for those working in new media, digital humanities, and the design disciplines. The app was developed by media artist Chandler McWilliams with input from Peter Lunenfeld. The Directorate offers an alternate mode of accessing The Secret War Between Downloading and Uploading. Not recommended for those with carpal tunnel, weak fingers, or short attention spans. Interface by Jon Gacnik from a concept by Peter Lunenfeld, Chandler McWilliams, and Brian Roettinger.